Filming of a new Sky TV drama featuring Game Of Thrones star Sean Bean will take place in Crewe this week. Sets have been built and letters sent out to residents to highlight the filming of new series, Curfew. 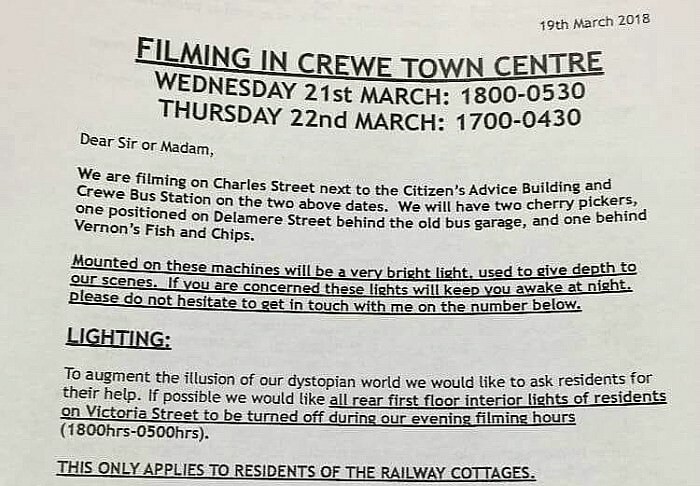 Filming will take place in and around the bus station and on Charles Street from 6pm today (March 21) to 5.30am tomorrow, and again from 5pm tomorrow to 4.30am on Friday March 23. Top stars including Bean, Adrian Lester, Robert Glenister, Phoebe Fox and Malachi Kirby star in the series which sees contestants going head to head in the ultimate contest. 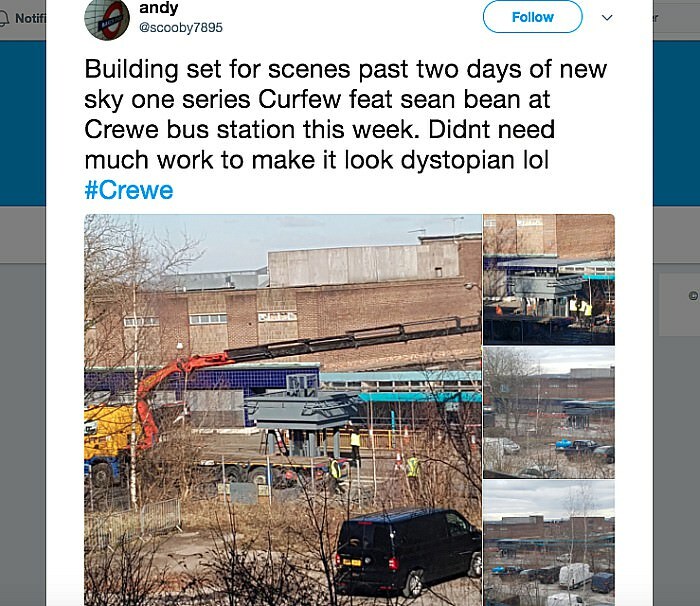 Workers on the set have also been tweeting about it (pictured) and a letter to residents warns people of powerful lighting being used during filming, as well as loud special effects gunfire. “Please do not be alarmed when this occurs,” states the letter, from production company Tiger Aspect Productions. Cherry pickers have been positioned in Delamere Street and behind Vernon’s fish and chip ship to film the action. Night scenes will also involve some stunt driving, with Charles Street and part of Victoria Street closed to vehicles and pedestrians. “We will be employing the services of a reputable traffic management company to implement all road closures and diversions. The eight-part Sky production is scheduled to be screened on Sky One and TV streaming service NOW TV next year. It follows the story of ordinary people competing in the world’s fastest, most furious, illegal night-time street race. Challengers risk everything as they race through the night from London to northernmost Scotland in their pimped-out, weaponised vehicles to win the ultimate prize — freedom from the totalitarian government curfew that controls their lives. Sky’s head of drama Anne Mensah said: “When Sky does dramas about car races, we do them like no other broadcaster. “Funny, emotionally truthful, visceral and above all fast – Curfew is the perfect Sky One show. You should try and get a part as an extra. That would be cool.